The book of Galatians might be the earliest of Paul’s epistles and it is definitely the harshest. When this letter was written to the churches in Galatia, Paul was steaming mad with righteous anger because false teachers were corrupting the churches he planted on his first missionary journey. 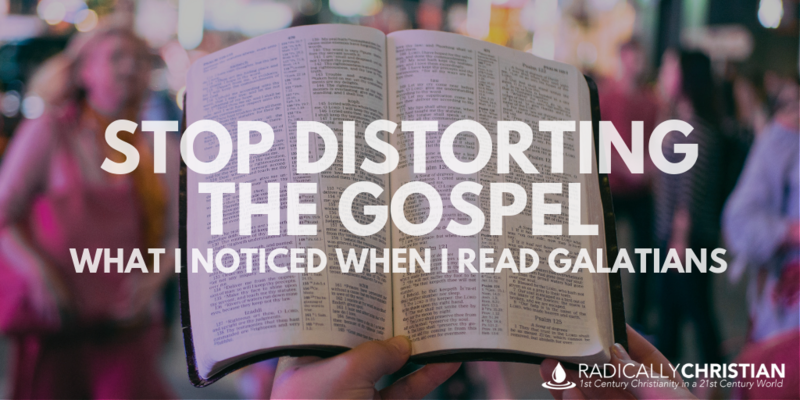 Here are a few things I noticed in Galatians about the gospel, the promises of God, the Law of Moses, and the Spirit. Out of fear, these Jewish Christians taught their Gentile brethren, “It’s great that you believe in our Messiah, but now you also need to be circumcised and keep the Law. But if you remain uncircumcised, then I can’t even eat with you.” They taught that the Law was the true basis for a right relationship with God and circumcision was still the sign that a person was part of the covenant people of God. Paul called the ideas being spread in Galatia a different, distorted, and contrary gospel. Now, let me clear on something. It is not fair or accurate to call every teaching with which you disagree a “distortion of the gospel” or a “different gospel.” If someone has different views on some things, it doesn’t necessarily mean he or she has “fallen from grace” or believed “another gospel.” In fact, it seems to me that a lot of folks accuse others of distorting the gospel when they themselves often have very little understanding about what the gospel really says. What is the gospel? Most of us probably know that gospel means “good news.” But “good news” about what? What is the good news? What has “the cross of Christ” really accomplished? We really ought to learn to think and speak within the categories laid out in books like Galatians. Christians today tend to ask very different questions than the questions actually being addressed in Scripture. We ask questions like, “What do I need to do to make sure I get to go to heaven?” Do you notice how that doesn’t sound anything like what Paul addresses in this (or any) letter? Paul isn’t addressing how to go to heaven, he is addressing who are the heirs of the promises God made to Abraham. Do you remember the story we started all the way back in Genesis? We haven’t switched stories. The Bible hasn’t suddenly changed storylines on us. It hasn’t suddenly become a story about floating on a cloud for eternity. A Gentile woman, a slave boy, a pious Jew, a Gentile landowner, Jesus has given himself to deliver all of these people from the present evil age and make them heirs according to promise. It would be hard for a Jew to accept, but Paul really did claim that through Jesus, every believer in Jesus could consider himself or herself a descendant of Abraham. Paul also made the point that the presence of God’s Spirit within their lives is the evidence that uncircumcised Christians really are full-fledged members of the covenant community of God. In other words, circumcision is not the sign of belonging to God, the sign is the presence of the Holy Spirit. And he emphatically reminded them that the Spirit, and not the flesh, needs to be their concern. Some of the people in Galatia were concerned with whether or not a man’s “flesh” had been cut away, but they needed to be concerned with whether or not a man was full of, “love, joy, peace, patience, kindness, goodness, faithfulness, gentleness, and self-control.” These qualities are from the Spirit. This is the fruit the Spirit of God produces in a person’s life when he or she walks by the Spirit instead of by the flesh. It seems to me, Christians today walk by the flesh when we are overly concerned about the appearance of things rather than the work of the Spirit in our lives. Like the Galatians, we also need to walk by the Spirit and not by the flesh. We need to learn not to put yokes of slavery on one another. We need to learn to embrace our identity as Abraham’s children, indwelt by the Holy Spirit, delivered from the present evil age, and awaiting our inheritance from “the Jerusalem above” to which we belong.